If you have any doubts about the growth potential of the fermented foods trend, dismiss them now. The sign that fermentation has reached its tipping point came with the decision by PepsiCo, the world's second-biggest food and beverage company, to acquire fermented drinks maker KeVita. The only trends that matter are the ones that give you opportunities to secure lasting growth for your business. 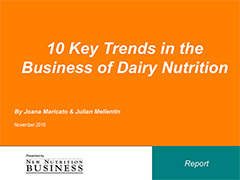 This report sets out the 10 most important growth opportunities in the business of dairy nutrition, highlighting some key white spaces for better margins and additional volume. The New Nutrition Business 10 Key Trends report is the only trend analysis dedicated to the business of food and health - and the only one that will help you spot the difference between an enduring trend and a fad. A small but growing number of consumers are taking personalisation to the next level, such as a genetic profile, or metabolism and disease risk via DNA tests. The power of this trend is reflected in the decision by food giant Campbell's to invest $32 million in Habit, a startup delivering personalised nutrition in an accessible way. The New Nutrition Business 10 Key Trends is the only trend analysis dedicated to the business of food and health and the only one that will help you spot the difference between an enduring trend and a fad. The 10 Key Trends present a mass of innovation and renovation opportunities for both big brands and entrepreneurial brands. For ingredient companies they help to make you as knowledgeable as your customers are. Innovation in healthy snacking is at the dawn of a new era of opportunity. Consumers will consider anything as a snack, which is why snacking is now a part of every company's strategy. And they are willing to be very experimental with flavours, ingredients, product formats and textures. New types of snack are growing fast, while also charging super-premium prices. Entrepreneurial start-ups are reinventing tired categories, from meat snacks to cakes. The New Nutrition Business 10 Key Trends is the only trend analysis dedicated to the business of food and health and the only one that will help you spot the difference between an enduring trend and a fad. The 10 Key Trends present a mass of innovation and renovation opportunities for both big brands and entrepreneurial brands. Breakfast has become one of the most fought-over battlegrounds in food and health, a battle fuelled by consumers' need for easy and quick meals in the morning, and by two massively successful disruptive innovations, Belvita's breakfast biscuit and Up & Go's liquid breakfast. This 65-page report shows how, around the world from Asia to America, breakfast is being 'snackified'. This means a wealth of new opportunities for companies in every food category. The dairy industry has always been at the cutting edge of innovation in nutrition and health. 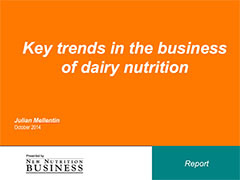 Dairy, more than any other category, is perfectly positioned to profit from the most important consumer trends. "I like to study failure." So said the world's third richest man, Warren Buffet, speaking at a Coca-Cola shareholder's conference. It is true that examining the most common mistakes that companies make enables you to avoid them. The smartest people know that studying the failures of others teaches us how to succeed. This is the 3rd edition of our massively popular and unique Failures report. A fully-updated analysis, featuring 10 completely new case studies, it incorporates the latest thinking about what causes failure and what cultivates success.